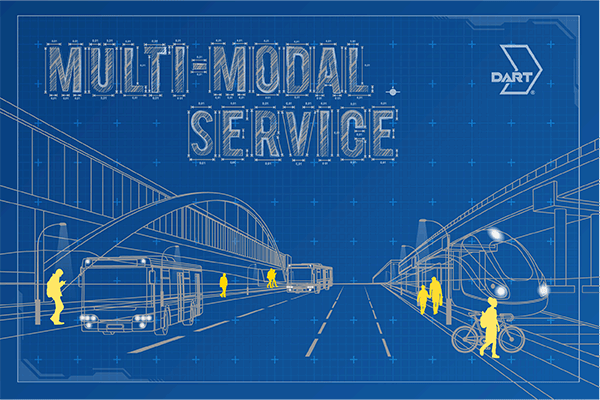 What Will Our Multi-Modal System Look Like in North Texas by 2040? DART’s 2040 Transit System Plan is in development, and considers the future of all different types of mobility options. Planning-ahead is essential, especially since DART’s transit projects are so large and can take years to develop and construct. In this series, we’ve looked at what’s inside DART’s 20-Year Financial Plan, including the general planning process as well as DART’s plan for expansion and buses. What’s On Track for Our System Overall? DART has two primary focuses when it comes to thinking about the future of Capital Planning Projects in North Texas. One of these are projects in the “Committed Program” and projects in the designated “Future Projects” group. The DART 2040 Transit System Plan will outline steps to enhance accessibility for all North Texans. Accessibility can be improved in many ways ranging from technology to enhanced customer information, to partnerships that can supplement existing service or provide more cost-effective service delivery solutions. System-wide improvements including “first and last mile connections” are also being proposed. First and last-mile connections refer to how people travel to complete their trip to or from a transit stop. DART is working with transportation partners to increase options to bridge that distance and make transit a viable choice for more people. Continuing to make repairs and system enhancements, as well as increasing safety and security are continuing priorities for DART. Stay tuned to learn more about DART’s 2040 Transit System Plan, and what we have in mind to keep our multi-modal transit system sustainable, affordable, and reliable for the future.